The secret to staying healthy is lowering your carbohydrate intake. And I don’t just mean losing weight, I’m talking about lowering your cholesterol, triglycerides and inflammation. The stuff that makes us chronically sick. 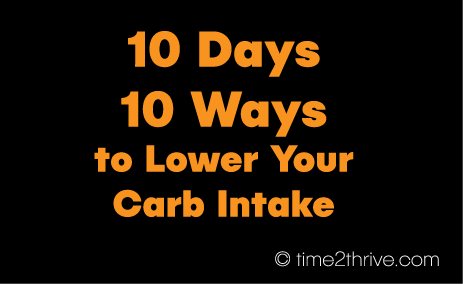 I’m going to post 10 days/10 ways you can lower your carbohydrate intake. MILK is nutritious, but it’s also fairly high in carbs because it contains a type of sugar called lactose. (Remember, its purpose in life was to GROW baby cows!). An 8-ounce (240 ml) glass of full-fat or low-fat milk contains 12–13 grams of carbs. This is especially important if you drink milk by the glassful or in lattes or shakes. SWITCH TO: coconut, almond milk, hemp milk. (Again, this isn’t about dairy, it’s about CARBS: case in point? Rice milk is a dairy alternative, but is FULL of carbs, and isn’t any better than milk, in fact it is the highest in carbs.). Look for unsweetened varieties that have less than 2 carbs per serving (carbs minus fiber = total carbs). Look at this comparison I’ve done of the various milk/milk substitutes. If you can’t change, start weaning yourself by adding one of the alternatives to your milk. I promise you, it is doable, and will save you calories and weight.